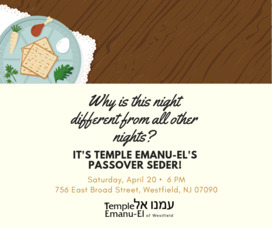 The committee on Religious Living of Temple Emanu-El is sponsoring a Second Night Seder led by the clergy on April 20, at 6:00 p.m. The seder meal is catered by The Ultimate Caterer of Marlboro, NJ. The meal will consist of a traditional seder plate, boneless breast of chicken, 4 side dishes, fresh fruit salad, and a dessert tray. In addition, children will feast on chicken fingers and fries. There will be a Seder plate on each table, with accompaniments, as well as a bottle of red wine, soda, tea, coffee, and a box of matzah. The cost for members is $60 per person and $30 for children 12 and under. In order to serve the community, Temple Emanu-El is offering this Seder to non-members at a cost of $70 per person and $40 for children 12 and under. Financial assistance is available through a confidential call to one of the rabbis or Brian Chartock. They may be reached at 908-232-6770. The seder meal is catered by The Ultimate Caterer of Marlboro, NJ. The meal will consist of a traditional seder plate, boneless breast of chicken, 4 side dishes, fresh fruit salad, and a dessert tray. In addition, children will feast on chicken fingers and fries.